Transport for London held a consultation, now ended, on the draft Nine Elms South Bank (or Vauxhall, Nine Elms, Battersea Opportunity Area in old speak) Design for Cycling strategy document. It has been said that the best cycling policy is a motor-vehicle policy. This document majors on cycling infrastructure but is light on detail concerning locations of filtered permeability and matching vehicle turning locations; taxi stands; loading/unloading bays; drop off points of passengers by drivers, and location of cycle parking in relation to car parking by shops. The design needs to ensure that space intended for fantastic cycling by the widest range of ages is not subsequently compromised by poor design for essential motoring needs, while reducing the need for motor vehicle journeys and making cycling the obvious choice for most journeys. 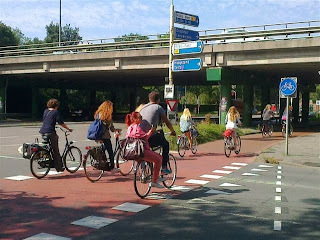 There should be a map with local schools showing how Dutch quality cycle routes will reach them and permit independent travel. 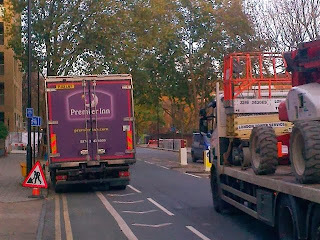 Given the length of time before the Northern Line Extension happens (if it is approved) and the indeterminate time-scale for completion of an uninterrupted linear park and Thames path, Nine Elms Lane should be made very cycle friendly as a priority in order to inculcate a cycling culture as soon as developments come on stream. 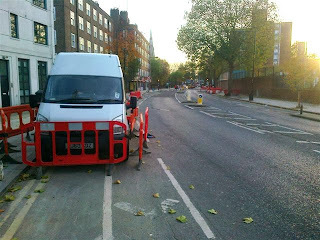 We recommend considering making this part of a realigned CS8. The policy should be to design for clear pedestrian and cyclist priority over turning traffic at minor side roads and building entrances. Where segregated tracks are used alongside a road, great care must be taken to make turning right using the track as efficient as turning right through being on the road. Hopefully a resolution will be identified as part of the revised London Cycling Design Standards with regard to the different rules for turning traffic that the Netherlands and Denmark have. Signal timings and banning certain turns for motor traffic may facilitate this. An appendix giving details on planning policies with regard to cycle provision (e.g. cycle parking for visitors) and motor-traffic reduction, with a statement on their quality in terms of the ‘Go Dutch’ ambition, may be useful. Treatment: 20mph speed limit; Motor traffic restricted to local access (filtered permeability). Review options for stopping this being a traffic-choked A road, making it an attractive cycle and walking promenade with cafés etc. 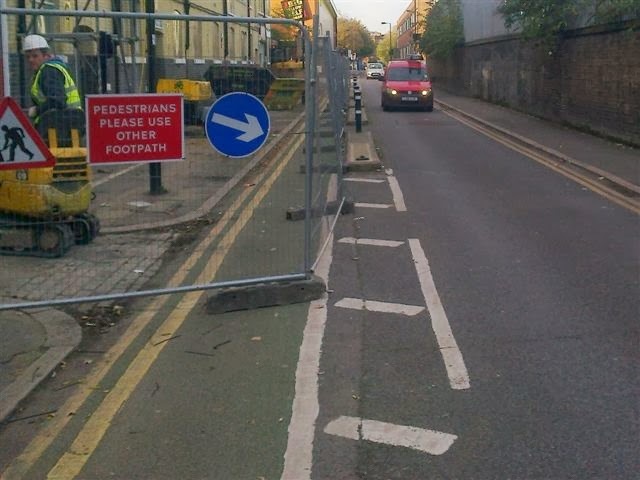 Every effort should be expended to making this area cycling friendly from now onwards, whilst acknowledging that there is a high level of construction activity. 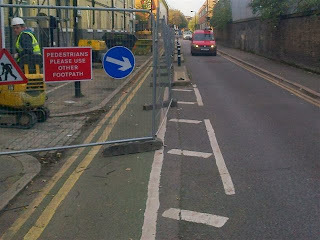 To this end Nine Elms Lane should have Dutch standard cycle provision implemented as quickly as possible. In conclusion, we hope that the above comments are constructive and helpful, and again wish to commend TfL on an excellent draft document. The tragic deaths and injuries to people riding bikes and walking in London over the past week will have put a huge dent in the Capital's aspirations to get more people undertaking active travel. We must not turn our back on these aspirations, because nurturing active travel is the easiest way to reduce congestion, tackle public health problems, cut CO2 and air pollution, improve people's finances and create a less noisy, calmer environment all in one. In short, create a more liveable London. It is absolutely crucial that all parties involved in use of, or management of, the roads pull out all the stops to make our roads safe for adults and children to use, but I saw yesterday how far we are from that. Around school ending time, I rode my bicycle along a short part of Lambeth's London Cycle Network route 3 (LCN3) from St Mark's Church of England Primary School next to the Oval cricket ground up towards Oasis Johanna Primary School by Baylis Road in Waterloo. London Cycle Network 3, mainly on back streets and with segregated space for cycling on busy streets, should be a prime example of a child-safe cycle route - important given that Lambeth Council intends the borough to be London's most cycle-friendly borough with cycling to school the norm. 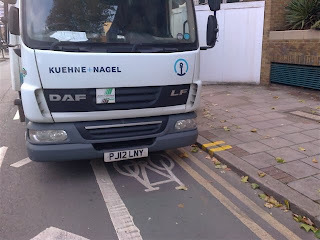 I took the photo above at 15.10 and the lorry, below, was still there on my return at 15.26, still in the cycle lane on the double yellow no-parking lines right by the no-loading lines. A little further along the road, construction work has led to the closure of the pavement, but an alternative has been found - the child lane can be closed:. 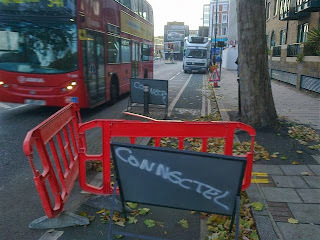 This allows the child lane to be taken over for pedestrians, while the children gather their wits about them (TM Boris Johnson) and jostle with the buses, vans and lorries. 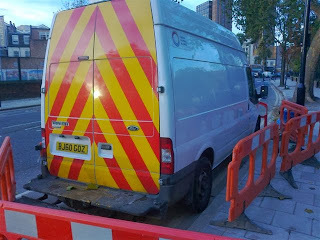 Could not the multitude of fencing have been put to better use by creating a child lane diversion around the van? In the light of the appalling deaths and injuries this week, I'm inclined to suggest that the professional, trained adults responsible for all the decisions above are guilty of child abuse. b) place those children who do cycle in clear and evident danger. 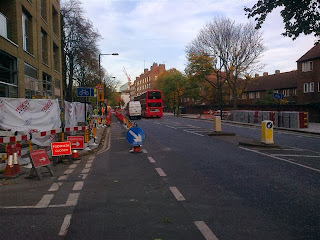 I have been sent the attached photos of Vauxhall Street. They show that the contraflow cycle lane is completely fenced off, forcing people on bikes into the narrow lane of oncoming traffic. Not only is it dangerous, especially to children using the route, it is also inconvenient and increases journey times for people cycling. Given our road user hierarchy, our approach in this situation should be to maintain the pedestrian and cycle routes and close the road to motor vehicles except for access to the supermarket and estate. We've been criticised in the past for our lack of consideration of cyclists at roadworks (Akerman Road; Baylis Road; Greyhound Lane) but I thought we had begun to remedy that. There are lots of examples of good practise regarding cycling at roadworks across London which we could learn from, for example recently on Union Street outside Palestra. Will you look into this urgently? It is important that we sort it out quickly as the current situation is unacceptable and I expect we will receive many more complaints. I wonder if his colleague arranged for the hazard to be removed today? Would one radical change improve walking and cycling in the UK? On 3 September 1967 traffic in Sweden switched from going along the left-hand side of the road to the right. What I'm proposing isn't as radical as that. 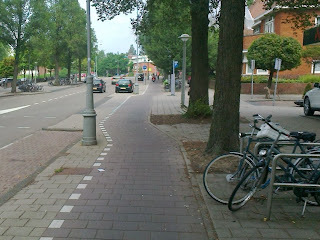 In the past months I've visited Germany, the Netherlands and Denmark as a pedestrian and as a cyclist. 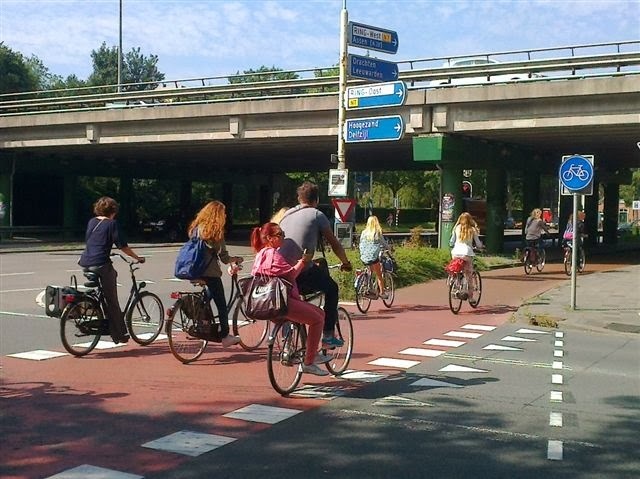 It seems to me that those walking and cycling in these three countries gain great advantage from the different priority rules these countries seem to have at junctions. 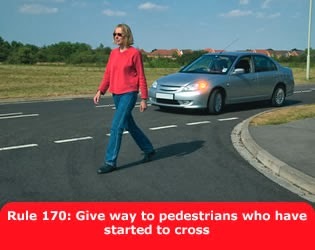 The implication is clear that pedestrians on the pavement and cyclists on pavement tracks approaching a junction should give way to road users wishing to turn. As a consequence of this ruling, pedestrians walking or jogging along a main road have to slow down and check it's safe to cross, stopping and giving way to traffic wishing to turn. This burns a huge amount of energy, and also forces people chatting while walking along together to interrupt their conversation. In contrast, drivers going straight on maintain their speed and continue chatting with their passengers. When the Highway Engineer designs a cycle track on a pavement, s/he will prudently place give-way markings wherever the main road intersects with a side road, however minor. Kinetic energy may be best understood by examples that demonstrate how it is transformed to and from other forms of energy. For example, a cyclist uses chemical energy provided by food to accelerate a bicycle to a chosen speed. On a level surface, this speed can be maintained without further work, except to overcome air resistance and friction. The requirement to slow down at a junction then get back to cruising speed saps a cyclist's energy. Given the disadvantages it is unsurprising that cyclists frequently prefer to use the road over cycle tracks in the UK. The priority rule also has an impact on a parent's willingness to let a child walk or cycle along such a road, in fear that the child needing to cross a side road may incorrectly judge the speed or distance of a turning car, or even neglect (forget) to look at all. This impacts on children's mobility and their fitness and likelihood of walking or cycling in later years. 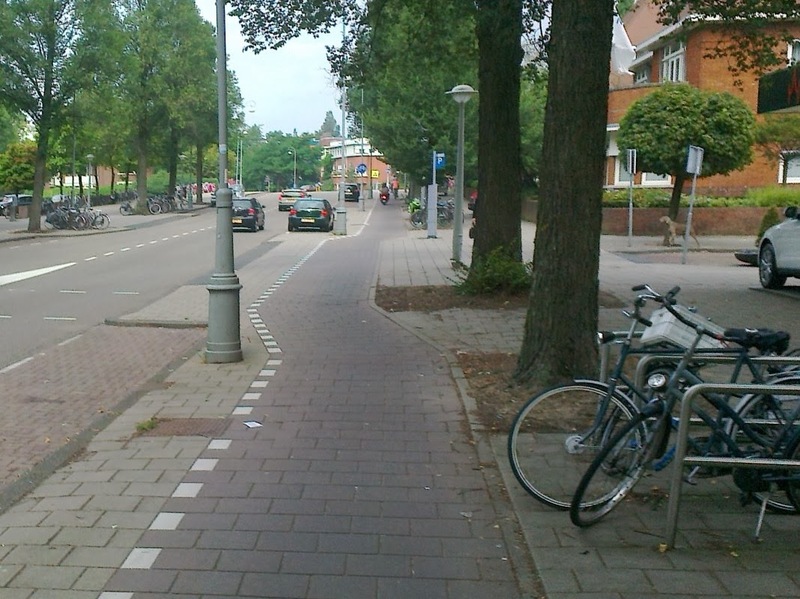 In comparison, as I understand it, countries such as the Netherlands, Denmark and Germany give all traffic (including pedestrians on the pavement and cyclists on a track) equal priority going straight on. The onus is on the person who wishes to turn to ensure that there is nothing approaching that they may turn into, whether they're on the road, pavement or cycle track. The walker, pedestrian, jogger, cyclists or driver going straight on needn't vary their speed, strain to look back, or interrupt their conversation at the junction. To achieve this, those wishing to turn pay greater attention to pavements/cycle tracks and to lanes, including cycle lanes, so slow down to a greater extent than is customary in the UK. Equally drivers behind a turning vehicle seem much less likely to beep impatiently at a driver who is waiting for a reasonable gap. The Danish don't use roundabouts, favouring cross roads as a safer option, and I observed a wonderful simplicity and efficiency in their system, due to the prioritisation I have described. When the east-west road users have a green light, so do the pedestrians and cyclists on their pavement or track. The lights then change in favour of motorists, pedestrians and cyclists in a north-south orientation. This allows those going straight on, by whatever means, to make rapid progress, having only to wait one light phase before it's their turn. 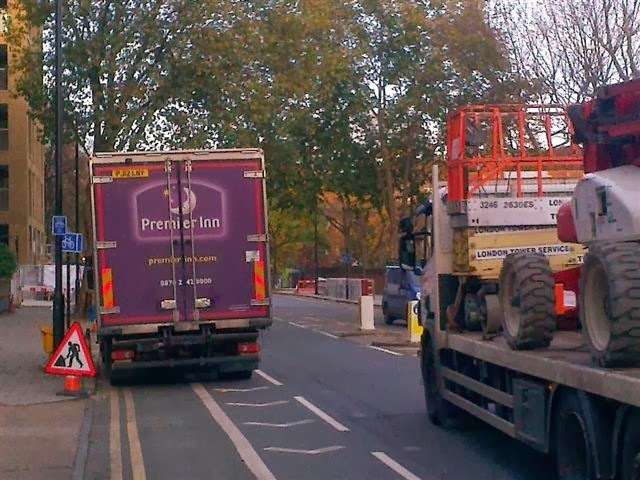 Taking the junction above as an example of a typical crossing, the cyclists and any pedestrians approaching us from the north have priority over the lorry driver wishing to turn right. If the cyclist coming towards us wants to turn left he will stop alongside the cyclists waiting at a red light to go west-east. The prioritisation means no separate pedestrian lights phase is needed, and as light phases in each direction are designed to be frequent but not overly long, cyclists are less inclined to jump the red lights as there is little if any time advantage in so doing. Equally the rapidity of traffic light changes means that cyclists are happy to use the cycle track against an occasional and marginal time advantage in using the road and the hassle of mingling with and working their way across lanes of motor-traffic.. 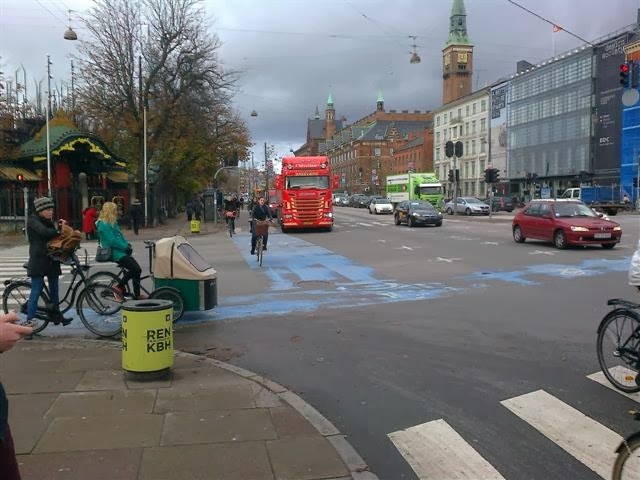 I'm not sure that the UK can achieve the levels of cycling that it aspires to, or better facilitate pedestrians, without a switch in priorities at junctions such as that described. It's got to be easier than switching the side of the road we drive on and that's been done successfully before. TfL have recently sent engineers and planners to look at countries making real progress with cycling and it'll be interesting to find out their take on this issue. To the best of my knowledge none of the campaigning organisations are asking for such a change. What do you think?